Announced on November 7, 2017: This flowchart is now obsolete. 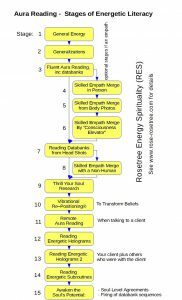 Click here to learn about 21 Stages of Energetic Literacy now used in Rosetree Energy Spirituality (RES). Energetic Literacy Flowchart, yes, bring it on! However, I’ve gotta tell you, Blog-Buddies. This chart is way obsolete. When my website redesign finally goes live, you’ll see an updated flowchart about 21 Stages of Energetic Literacy. Want to see this Energetic Literacy Flowchart look bigger? Click on it! As a consumer, it can help you. Plenty of people offer services like aura reading, psychic reading, clairvoyant reading, energy reading. Are they alike? I don’t think so! 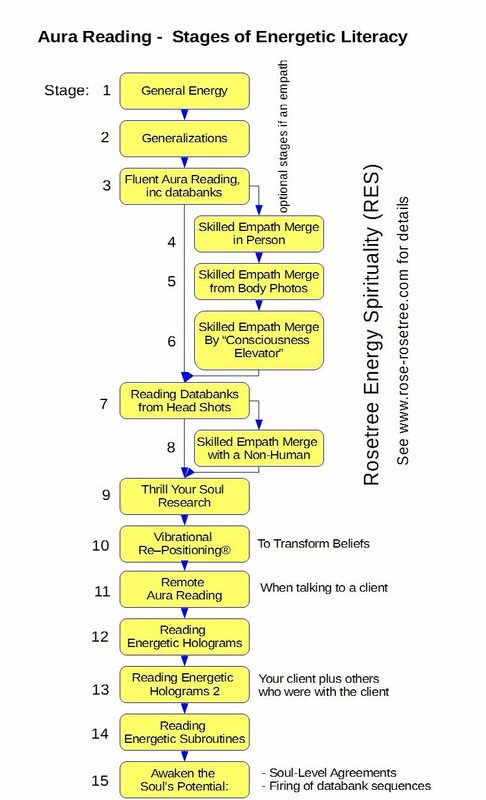 This flowchart gives you an inside look about sessions, books, and workshops connected with Rosetree Energy Spirituality (RES). Funny thing is… Every part of RES depends on skills of energetic literacy. What Probably Can Help You Most? See Stage 3 on this Energetic Literacy Flowchart? I can teach you this! Basically, what happens when you have reach this level of skill? The energy equivalent of word literacy. So useful! For instance, see Aura Reading Secret for Better Health. What a Gift, This Energetic Literacy Flowchart! Big thanks to Blog-Buddy and Blogger, DAVID BUCKLAND for volunteering to create this flowchart. To learn more about all these stages, see this article: The 15 Stages of Energetic Literacy. So all of this pushes the leading edge of this rapidly growing field of RES. Not just a little energy sensitivity, sweet and meaningful… but often inaccurate. And frankly, a sign of big talent + small skills. If you can read this screen, that’s word literacy. You have what it takes to learn energetic literacy, too. This free online workshop on aura reading can help you get started. Can this Flowchart Make Energetic Literacy Easier for You to Understand? I use all these aura reading skills. As my students are ready, I teach them. All part of RES! Btw, which levels do you teach in state 1 and stage 2 aura reading? Very cool! I do fine with lists, but it’s still nice to see data presented in multiple ways. Not sure if your question was addressed to Rose or myself. Also not sure what you mean by levels. But if you mean awakening / enlightenment/ Unity, etc, thats a different thing. This flow chart is listing skill levels. Something optional to be developed. The resulting increased clarity is very helpful for culturing those stages but they can be developed quite separately. Thanks for responding David. I meant, which levels does Rose teach in her workshops. Just a consumer question, I guess. Rose would the better to answer but my understanding is she teaches roughly the first half in workshops, and some of the next batch to RES apprentices but doesn’t yet teach the later ones. I know a small number of other healers with similar skill levels but they don’t teach the skills. Well meant try, DAVID B. The Aura Reading Level 1 Workshop helps participants regardless of your level of Energetic Literacy. And we do have people at Stage One and Stage Two who attend, even sometimes Stage Three. I’m making this point to clarify that this Level 1 Workshop is not just for beginners. I’ve had professional psychics and other very experienced aura readers attend and enjoy great breakthroughs in skill and understanding. Please know that whem I refer to workshops as Level 1 or Level 2, etc., that’s for convenience. Just like college courses in the U.S. might have Energetic Literacy 101. To be followed by Energetic Literacy 102. Do they do the same in Scotland, BTW? I’m going to continue responding to your question over at my original post that describes in more detail how RES-style energetic literacy develops. Beautiful though this graphic is, it leaves out many important details. And for responding properly to your question, LILIAN, those details are pretty darned essential. I do apologize, LILIAN, for not responding to your excellent question in a timely way. It’s really busy around here lately, including at this blog where, yesterday, I think 50 comments were put through. Maybe more. * Sometimes the the ALPHABETICAL Enlightenment Life List, if the candidate makes the CHRONOLOGICAL main list. * A window for viewing the submitted photograph, natch! You know, I take those nominations seriously. For me, this isnt just gossip or a trivial hobby. I mention this because your question was important in a different way and needs more time and care in responding, even, than that sort of thing. Blog-Buddies, if ever you ask a major question like LILIAN’s here at this blog and you don’t receive a response after a week, please do bring it up again in a comment. That is useful to know. I get the idea. Yes, we do have similar numbering here. RES101 and RES102. At Rose’s request, I updated the graphic a little so some of the later stages were not misleading.